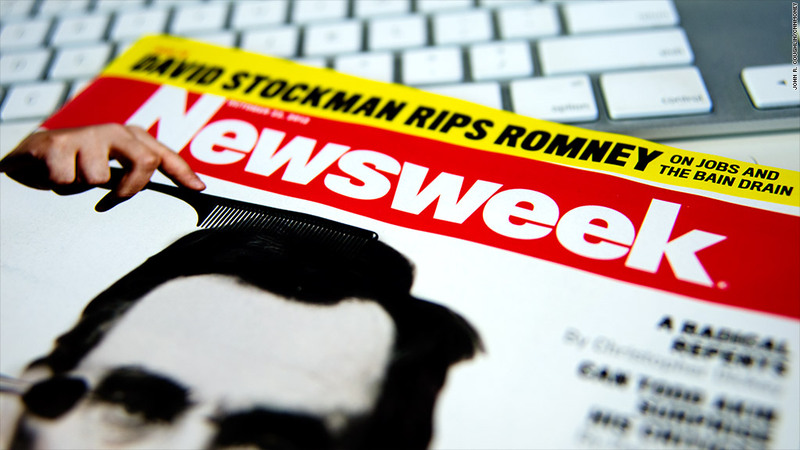 Newsweek, which abandoned its print edition at the end of 2012, has been sold to IBT Media by IAC. Newsweek, the iconic news magazine whose print version was abandoned late last year, has been sold to an all-digital news company, IBT Media. IAC, (IACI) another online media company, sold Newsweek for an undisclosed sum, IBT Media announced Saturday. The Daily Beast, the IAC site that operates Newsweek, announced last October that it would abandon the magazine's print edition at the end of 2012 and run the content strictly online. Tina Brown, the editor-in-chief of both Newsweek and The Daily Beast, said at the time that the growing use of tablet computers by readers, combined with continued weakness in print advertising, forced the decision. IBT said Saturday it will take control of Newsweek's content 60 days after completion of the deal, which is expected "in the coming days." "We believe in the Newsweek brand and look forward to growing it, fully transformed to the digital age," said Etienne Uzac, IBT Media's CEO in a statement. "We respect the brand's long history of delivering high-quality, impactful journalism and believe this aligns well with IBT Media's culture and mission." New York-based IBT Media's other online properties include International Business Times, Latin Times and Medical Daily. Related: Time Inc. taps veteran executive Joe Ripp as CEO. For most of its 80-year history, Newsweek was owned by the Washington Post (WPO) (WPO). But the Post sold the magazine to audio industry pioneer Sidney Harman in August 2010. It was merged with The Daily Beast in a deal finalized in February 2011, creating a joint venture that was half-owned by IAC. IAC/Interactive took a controlling interest in the joint venture in 2012. IAC says it has more than 150 online properties, including The Daily Beast, Ask.com, Match.com and Vimeo. The print edition of Newsweek was a long-time archrival of Time. Time is published by Time Inc., a partner in CNNMoney with its fellow Time Warner Inc. (TWX)unit CNN. --CNNMoney's Chris isidore contributed to this report.